Please use our online form to schedule a home health needs assessment. Would you like to submit your referrals? Please use our online form. We thank you for choosing New Life Home Health Care LLC as your provider of health services at home. As care professionals, we believe that it is our duty to efficiently manage you and your loved ones health through customized care plans that specifically address your various needs as new mothers, as expectant mothers and for every individual with unique health situations. Our job revolves around helping you manage the symptoms of your illness. We also help you with your mobility difficulties and our nurses are trained to provide assistance to new mothers in caring for infants upon returning home from the hospital. From children to adults, we are sure that your confidence in our services will not be failed. We see to it that the care we give you at home is at par with the quality you would receive in nursing care facilities, medical care centers and the hospital. The difference is that you can get the same level of professional medical attention right where you live. 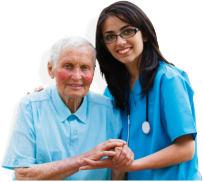 New Life Home Health Care LLC will be your provider of convenient, affordable and first-rate health services. Know more about us by browsing through our patients’ testimonials. The Agency's mission is to provide professional and paraprofessional services to clients in their homes assisting them to achieve the highest level of potential in their day-to-day self-care activities. We are committed to providing high quality, multidisciplinary care by professionals who recognize the need for comprehensive assessment of needs from both the client and professional's point of view.